In recent months, there’s been a steady drumbeat of stories about the coming death of apps. The reasons for this claim are several and include slowing growth rates for the top 100 apps, the rise of bots as an alternative to the app model, or a general sense of dissatisfaction with the state of apps. This week, however, Apple hosted its annual developer conference, WWDC, and demonstrated the era of apps is far from over. Apps are evolving and it’s worth looking at both the true state of apps today and how that’s likely to change over time. As you can see, based on the periodic data points Apple provides, that number has been growing faster, not slower, over time. 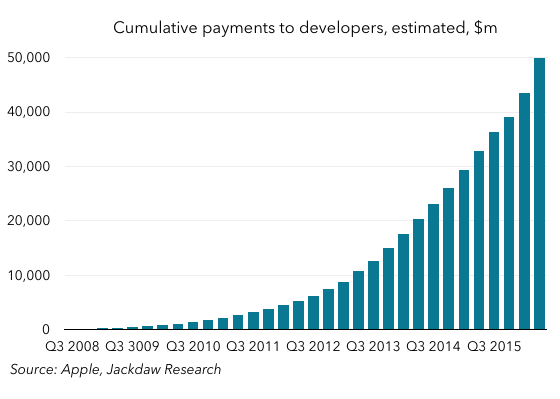 In January this year, Apple announced customers had spent $20 billion just in the past year, while the new figure from Apple puts the increase in developer payments alone (just 70% of total spend) at $10 billion since then, in about six months. Clearly, the largest participant in the app economy is doing just fine despite the supposed demise of apps. For what it’s worth, I suspect we are entering a period of maturity for app stores, in which the vast majority of users have downloaded the most popular apps already and, as growth slows, there will a shift to the long tail of apps among existing users, while a smaller number of new users download the top 100. But the total audience for apps has never been bigger and there’s little evidence this trend will slow app store revenue growth or even total downloads. Bots are a fascinating new element of mobile user interfaces and have potential in certain well-defined use cases. However, as a threat to the app model, they’re fundamentally limited for a couple of reasons. First, bots are not a fit at all for the vast majority of apps. Put another way, for the apps that generate the vast majority of revenue. Consider that roughly 75% of app store revenue globally comes from games, a use case for which bots are entirely unsuited. That means 75% of app store revenue is entirely untouched by bots. But it really goes further than that – productivity apps such as Microsoft Word, note-taking apps like Evernote, social networking apps like Facebook, video apps like Netflix, photo editing apps like Instagram or VSCO, e-readers like Kindle, and many other apps in many other categories are equally impervious to the threat of bots. Bots may, in time, encroach a little more on new categories, but the vast majority of things bots are useful for fall into two camps: B2C interactions, and reference. Given the focus on B2C interactions, it’s no wonder three of their biggest proponents are companies with a vested interest in fostering activity in that category: Microsoft seeks to dominate enterprise software, while Google and Facebook dominate online advertising by businesses to consumers. But apps which provide that functionality are a tiny minority of those in the various app stores and generate even less revenue (mostly because they’re merely customer interaction interfaces for businesses whose revenue is mostly generated elsewhere). The last counterpoint to the idea that bots are a threat to the app model is that, of course, bots exist more or less exclusively within apps. Whether it’s Facebook Messenger, Google’s Allo, Microsoft’s Skype or some other version of the concept, all are themselves apps which are downloaded in the traditional way. Yes, some revenue opportunities and time spent that would in the past have gone to app stores may now accrue to these platforms instead, but as we’ve already seen it will be minimal and, in any case, any in-app purchases will still go through the major app stores. The other thing to note is the meaning of the word app is very different today from its meaning in 2008, when Apple’s App Store launched, something I’ve written about previously. As I wrote in that earlier piece, Apple has been at the forefront of evolving what apps look like and one of the biggest changes has been their escape from behind the rounded rectangles into other facets of the operating system. Even before this year’s WWDC, that included 3D Touch, Notifications, Widgets, keyboard and content blocker extensions, and more. At this week’s event, though, we saw it evolve still further with the extensions model applied to Siri, Maps, and iMessages, more interactive widgets and notifications, VoIP apps on the lock screen, and more. As the concept of an app continues to evolve, it becomes better able to resist the encroachment of alternative models onto its turf. The opening up of iMessage, Siri, and Maps in particular will change the way apps are presented to users, but that process will still begin with a download from the App Store. The same goes for many of the other virtual assistants out there, most of which will either constitute apps themselves, or rely on installed apps for some of their functionality. Google, of course, is also evolving the app model, most recently with the announcement of Instant Apps, which itself builds on the concept of app streaming. Neither of the two companies which dominate app downloads worldwide is standing still. That’s why the app model will continue to be robust despite the rise of alternatives. Some of those alternatives may carve off tiny slices of the overall opportunity, while others will morph until they become part of the app model itself. But the app model is here to stay, even if it might be hard to recognize by the time it reaches its tenth birthday three years from now.